Chilcot Report Finds Britain Rushed Into Iraq War : The Two-Way The report, which is more than 6,000 pages long, found that there was no "imminent threat" by Saddam Hussein when the British decided to join the U.S. in war. Former British Prime Minister Tony Blair holds a news conference at Admiralty House in London after retired civil servant John Chilcot presented The Iraq Inquiry Report on Wednesday. After seven years, the British have released the findings of inquiry into the Iraq War. 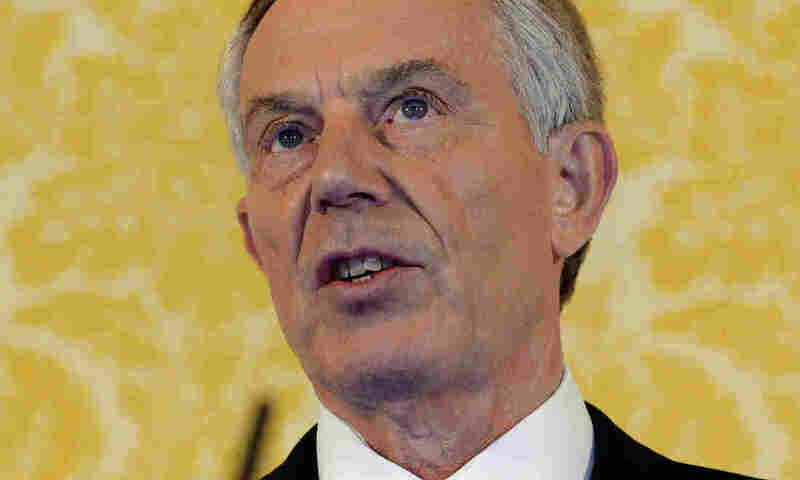 "Protesters yelled, 'Tony Blair war criminal!' outside Britain's Parliament. An investigation has concluded there was 'no imminent threat' by Saddam Hussein when Prime Minister Blair decided to invade, alongside the U.S.
"Blair decided to invade before all the evidence was in, the report says. Families of the 179 British troops who died in Iraq are weighing lawsuits. "Blair issued a statement in his defense, saying he made the decision to go to war 'in good faith.' "
"Mr. Blair knew by January 2003 that Washington had decided to go to war to overthrow Mr. Hussein and accepted the American timetable for the military action by mid-March, pushing only for a second Security Council resolution that never came, 'undermining the Security Council's authority,' the report concludes. "The report is likely to underline in Britain the sense that Mr. Blair was 'Washington's poodle,' the phrase widely used by Mr. Blair's critics at the time. The report says the lessons from the British government's conduct are that 'all aspects' of military intervention 'need to be calculated, debated and challenged with the utmost rigor,' and decisions, once made, 'need to be implemented fully.' "
CNN reports that Blair also held a news conference to respond to the report. "The intelligence assessments made at the time of going to war turned out to be wrong," Blair said. "[Blair] also said that he made the decision because 'it was the right thing to do based on the information I had.' He said his mistake was in the 'planning and process' following the invasion."